The Good City, Ambrogio Lorenzetti, 1338. What if Rochester were a good city? Would it be different than the city we live in today? How would it be different? I find myself reflecting on these questions because I remain preoccupied with my sense of the difference between a good city and the city we have become, the city of convenience. First, and reasonably, you may ask: “What is a good city?” This is a worthy question, and one that merits our reflection at some length. I would say that a good city is a city that is healthy, sound, robust, sturdy and strong. I might further say, hearkening back to the seven ancient virtues of western philosophy, that a good city is characterized by justice, courage, hope, charity, prudence, faith, and temperance. So we’re not quite there yet…. In fact not many cities score all the way to “good.” But I would contend that achieving “good” is a correct, perhaps the most correct goal of the citizens of any city. And “good” is a very, very difficult goal to achieve in the context of our contemporary urban life. If a city were a good city, jobs would be abundant; education would be thorough, of the highest quality, and accessible to all. Poverty would not disappear, but the inequities that are so much a part of urban life among the poor would not be the heavy burdens they are today. In shorthand, it would be good to live in a good city. Better than living in most cities today. Melbourne comes close, as perhaps do Copenhagen, Auckland, and Vancouver. Our city is a long distance from the good city. I-490, Rochester New York, photo by Erdman Anthony. The newspaper here in Rochester yesterday morning offered me a tiny little window on this disconnect between the good city and the convenient city, and provoked me to further investigation. The paper said that in our urban region over 80% of us commute to work alone in our cars, while only 2.5% of us use public transit. Oddly, though the figures come from the U.S. Census Bureau and seem thus to be reliable, 3.4% of us walk to work – more than use transit. (Just as a frame of reference, 56% of New Yorkers, and 24% of Torontonians commute to work on pubic transit). Then it was time to dig a little further. In the city itself, 69.5% of commuters drive alone in cars, 7.7% use transit and 6.7% walk to work. Further, I learned that 26% of city dwellers have access to 0 vehicles for their commute. What can we begin to deduce from these statistics? Well, first, public transit doesn’t seem to be working very well for anybody, whether suburbanites or city dwellers. Transit use is low in the city and negligible in the surrounding suburbs. When walkers and transit users are nearly the same percentage of commuters, you cannot reason that you have stumbled into a good city, where walking prevails. Instead, you can only reason that the transit system is broken. In fact, with a little poking, I discovered that the busiest bus line in our region carries 2,270 riders on a weekday, and the busiest bus stop saw 400 users a day (in a location, I note, with almost 20,000 employees). As context, in New York City a busy Manhattan bus line carries 43,000 commuters per workday and in Buffalo, the downtown light rail carries 15,700 riders per workday. And next, city dwellers have higher transit use than suburbanites, but many fewer have cars. More research required here, but it’s sounding a little like an equity issue. If you don’t have access to a car, and you don’t use transit, are you unemployed (unemployment rates are as high as 40% in some our city neighborhoods)? And then there is the car/convenience equation. 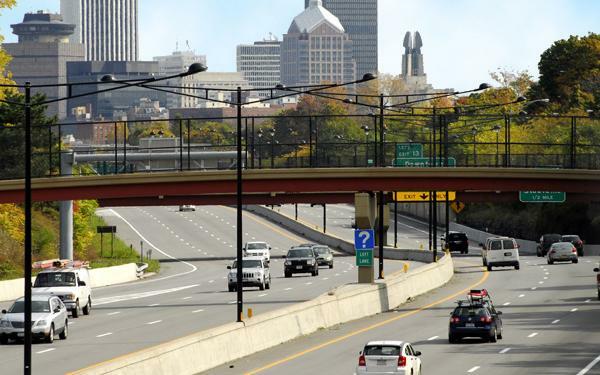 In the last 15 years, nearly $500,000,000 has been spent here on three expressway interchanges alone. This seems a bit obscene in a city ranked as the 5th poorest in the U.S. So on this Labor Day weekend I am reflecting on the city we have made and how it works, and for whom. And I am trying to imagine a counterpoint to what I see – a better city that could eventually become a good city. The differences seem a bit stark. More to follow, I suspect.